Three patient samples were positive for ALK — these patients with peritoneal mesothelioma were women with no history of asbestos or radiation therapy exposure. They also looked in samples collected from patients with pleural mesothelioma — the more common form of the diseases — but none of those samples were positive for ALK. The ALK gene is important during embryonic development of the nervous system but should be inactive later in life. 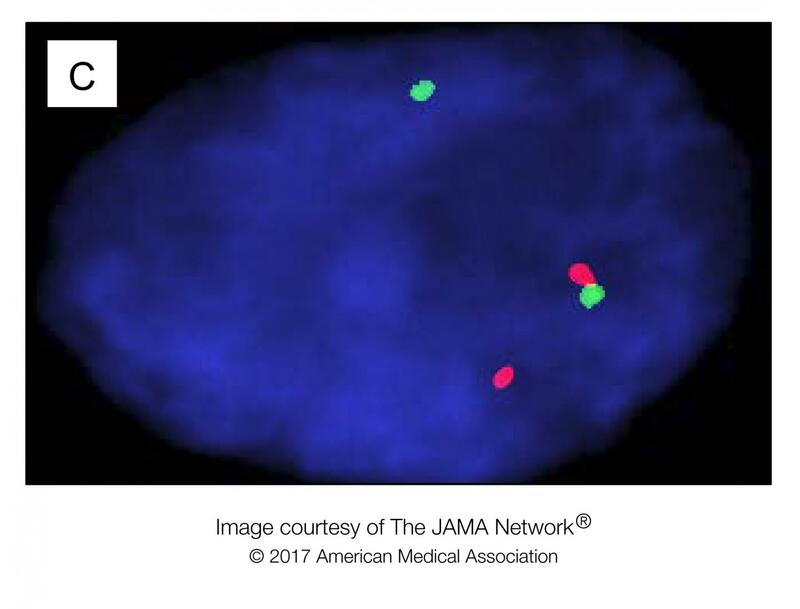 Previous studies of genetic alterations in lymphoma and lung cancer have found that certain genetic mutations — specifically when part of a gene breaks off and gets fused to another — can inappropriately switch on ALK, driving cancer cells to grow and divide. Targeting ALK with therapeutic drugs can turn that switch back off, blocking cancer progression — at least temporarily – without harming healthy cells. The FDA has approved several ALK inhibitors for treating non-small cell lung cancer. While the costs of targeted therapy may remain high, the cost of diagnostic testing for such genetic rearrangements is low. Chirieac and colleagues hope to extend their study of ALK-positive mesotheliomas in a global patient population. In his own practice, Chirieac is routinely examining for the presence of ALK rearrangements for patients with mesothelioma and educating his residents about this new finding. "When I teach my residents about the causes of mesothelioma, I talk to them about asbestos, radiation therapy and an inherited mutation," said Chirieac. "We believe this paper adds a fourth cause to that list – one that is potentially clinically actionable." Other researchers who contributed to this work include Fei Dong, Jaclyn Watkins, Valentina Nardi, Raphael Bueno, Paola Dal Cin, John Godleski and Christopher Crum. Chirieac serves on the Advisory board of Merck Sharp & Dohme and undertakes medicolegal work related to mesothelioma and lung cancer. Bueno receives support from the National Cancer Institute, Verastem, Genentech-Roche, and Castle Biosciences via research grants at BWH. These financial disclosures do not apply to the current study, which is not associated with a specific source of funding.